Limited Time Introductory Sale Price of $599. Stay tuned for more demos and videos. Comprehensive divisi orchestral and scoring brass. Years in the making. Simple to use. We are very pleased to announce: Modern Scoring Brass (MSB). Modern Scoring Brass sets a new benchmark in orchestral and scoring brass and is built on our new orchestral engine. Since there has been so much anticipation about our brass offering, we thought you may want to know ahead of time. This 30 piece multi-instrument divisi library was painstakingly developed by recording different players (one player at a time)* on a trusted scoring stage giving you unprecedented individual control of each instrument and section. The breadth of instrumentation was chosen to offer an enormous range of colors and emotions for your productions. Since the release of LA Scoring Strings in 2009 we have been asked repeatedly when audiobro will release a brass library. We have always said that we would do it only as soon as we believed that we could push the quality and versatility of brass sampling forward a generation. We know that “next generation” are words that get thrown around very liberally by sample library developers, but we think in this case you’ll agree. Read on to discover a few reasons we think MSB might delight you. 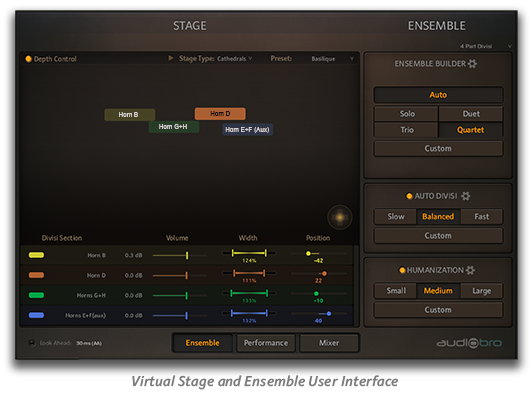 To see our new orchestral engine in action, check out our latest release Genesis. It will give you a good idea of what to expect from MSB with regards to layout and ease of use. * All players were recorded one-at-a-time except for Horns 5 & 6 and 7 & 8 who were recorded two-at-a-time for added variety and flexibility. Because we like surprises, here are a few things we didn’t mention in our original announcement. MIDI drag-drop to your sequencer. The #1 most requested feature for A.R.T. Capture your performance and drag the MIDI right in to your DAW. While A.R.T. classic works just like you remember in LASS, A.R.T. New automatically keeps your playing in time without needing any keyboard precision. New ARP mode lets A.R.T. work as an arepggiator as well, with 15 pre-defined patterns. New Ostinato Tool – a hybrid of an arpeggiator and a step sequencer. Lets you program your own arpeggiated patterns with separate settings for each chord-size (up to 6 note chords). Sometimes it’s the little things: Swing, Humanization, Velocity Syncing, Latching. Each patch comes pre-programmed with legato transitions that are great sounding and quick to respond to your playing. But, you can also adjust the speed of the note transitions to your liking or easily automate them during your legato performances. Our continuously speed-adaptive legato engine keeps working behind the scenes regardless. MSB is a big library, and some of you will want to get started right away. In addition to the full download which includes all samples we also offer a Full Mix only download that will get you up and running quickly with less space required on your hard drive. Then download the full sample set at your convenience. Player-first design focus with ability to play faster and virtuosic passages. Intuition Instruments are extremely responsive to your playing and augment it with modeled legato, embouchure pressure, and other dimensions of realtime performance without delay or MIDI programming. Disconnected connections. The idea that notes in line only affect each other when played legato is just not true. Intution offers everything from a detached-legato to round robin shorts that “connect” (influence each other) naturally as you play faster passages. Legato-staccato may be an oxymoron, but even when notes aren’t legato, many performances are inherently connected. Again, just play and the Intuition Engine will take care of the details. Simple, familiar controls – dynamics, vibrato, and note-connection. Access to sustains, legatos, and shorts – as well as both muted and un-muted sounds. 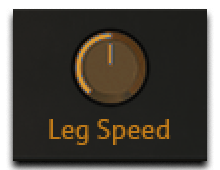 The engine plays monophonic legato like you’re used to, but also has a brand new polyphonic legato engine that functions without any input latency. Multi-mic. The same sample pool from the master patches in Modern Scoring Brass means access to all 4 mic channels in any combination. 21 of the chairs from Modern Scoring Brass are currently offered as Intuition Series instruments, each with their own personality. Intuition Instruments work wonders on their own – but also greatly complement the main patches. For instance, layer an Intuition Patch with one of the MSB master patches and get the best of both legato worlds. Low on RAM – low on load time. Big fun. An engine that continues to evolve. From the dulcet tones of a lone trumpet in the back of a great concert hall to 4 Cimbassos (divisi of course) blasting your face off – and everything in between. A library that finally captures the broad expressive range and diversity of the brass family. Pristine recording and meticulous editing ensure every note of your music will shine. A brass library as diverse and nuanced as your music. MSB was performed by true brass masters and was recorded one player at a time. This gives you the ability to build your own sections using the sizes and instruments that best suit your production. Note: scroll down to the “Patches and Articulations” section to see all the patch charts detailing their articulations. Great brass players have an enormous range of attacks possible when playing in any range AND at any dynamic… your brass library should too. Modern Scoring Brass introduces the concept of Variable Attack Control and makes it available on every instrument in the library (mutes and stops included). Most importantly, these aren’t Frankenstein sample edits or synthetic envelopes. These are real variable attack samples – recorded on each note and at each dynamic. Once you try it, you’ll never want to go back. Shorts. Lots of them. Done right. Four lengths of shorts including tenuto-quarters, staccato, and staccatissimo – plus killer double tongues that finally sound professional (without all the wobbliness you hear in other libraries). Up to 9 x Round Robins… meticulously recorded and edited for nimble playback. Switch between them seamlessly or let our playback-speed recognition technology switch for you. An Assignable Repeat Key makes fast double tongue playing of notes AND chords a simple matter. Next generation multi-dynamic, continuously adaptive Real Legato is responsive, fluid, and available for every single instrument in the library. There are no second-class citizens. No shortcuts. Real recorded muted sustains and stops with variable attack control. Real recorded muted and stopped legato. Muted shorts articulations with the same configurations and double tongue combinations as their non-muted counterparts. When you play our Crescendos and Sforzando-Crescendos they will sync to the next downbeat, or upbeat (or pretty much wherever you’d like). Or play them unmeasured. Similarly, our trills will play measured or unmeasured at variable speeds using simple half/whole-tone trills or with our smart diatonic trills. Trombones, Horns, and Euphoniums all have extended ranges by the use of recorded pedal tones. This would include Sustains, Legatos, and shorts! Real recordings of the lower register typically not found in other libraries. Put your players where you want them. Standard orchestral seating, antiphonal brass choirs, close-miced tight dry sound, whatever your production calls for. 52 of our eclectic custom created spaces run the gamut from small dry rooms to huge churches and effect. Plus 13 new additional spaces have been designed specifically for Brass. Responsive enough to keep up with your fastest double and triple tongue playing, our Auto Divisi engine will naturally divide your chords among the players in your section for maximum realism. Or turn off Auto Divisi to hear thunderous giant brass sections. Polyphonic legato that’s set-and-forget. The main performance page interface allows quick access to all the main playback controls. Instruments come pre-configured for easy articulations switching but setting things up your own way is simple and intuitive. We have carefully programmed and combined multiple players into single patches making it simple and intuitive to load a group of section-players or a single player — you have total control. With our new and intelligent Auto Divisi, you can simply play and our engine will distribute the players evenly to your chord tones avoiding the dreaded (and fake sounding) samples build-up sound so familiar in other libraries. Real Variable Attack Control: real variable attack samples on all sustains – recorded on each note and at each dynamic. Finally, real sampled embouchure control. A full compliment of articulation key switches come pre-set, but you can also build your own. Set up layers and settings just the way you want, then make it a key switch away. Independent control of players tuning and humanization and vibrato. Advanced Key Switching by Key, CC, velocity, and combinations thereof! The Ensemble page is where the Stage and Audiobro’s coveted Auto Divisi and Delay & Humanization (DNH) features reside. Here you can choose and place your players on our virtual stage and our Auto Divisi will intelligently cater to your choices. 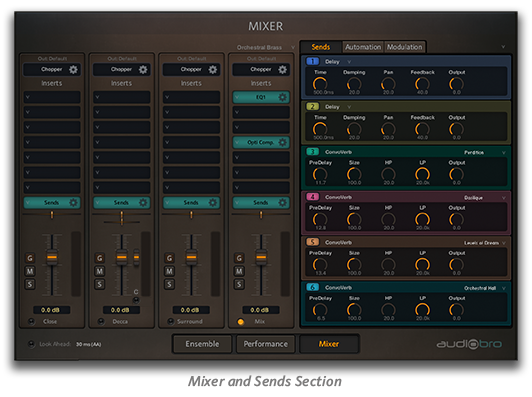 Audiobro’s new Mixer engine features extensive Modulation, Automation and Effects Sends sections that allow you to tailor your sound in compelling ways while keeping things simple and intuitive. 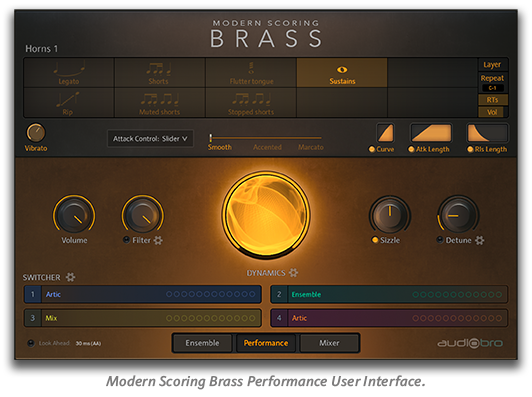 Modern Scoring Brass integrates seamlessly with Native Instrument’s Komplete Kontrol software and NKS eco system. Control the most important features of MSB directly from NI hardware and using your sequencer’s device automation. We’ve made it quicker and easier to find sounds – browse and load all KOMPLETE Instrument presets from a single plug-in. Knobs will display all the relevant controls on NI’s LED displays. Each patch in Modern Scoring Brass has been carefully crafted over hundreds of hours to allow for a consistent out-of-the-box experience. 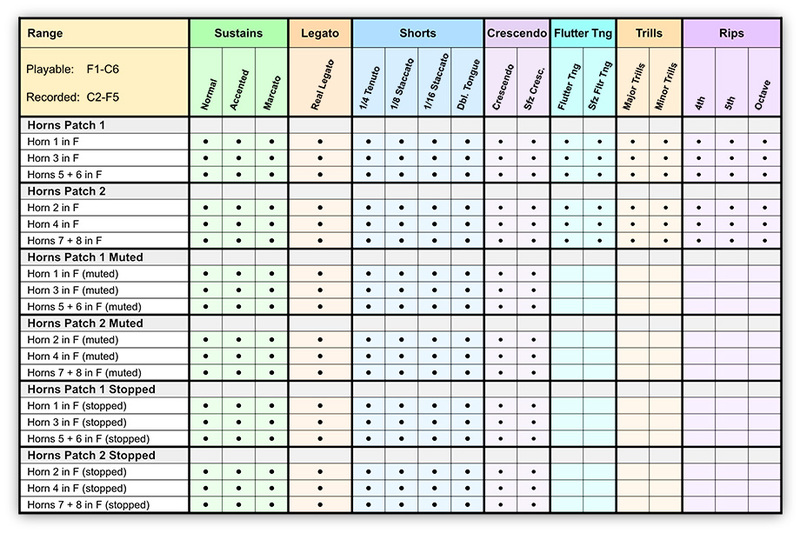 The charts below detail the patches for each brass instrument family and their articulation contents. Each divisi section is comprised of entirely unique samples. Please keep in mind that the charts represent dynamics ranging from ppp through fff. Using our exclusive Auto Divisi feature, all patches can automatically distribute your chord voicing (up to 8 notes) among the different players. Even if there are only 4 truly divisi players, you can still play more notes than there are players and our engine will automatically balance out the “extra” players to each note. This makes an enormous difference in the realism of the sound and avoids that dreaded sample-buildup sound all too common in other libraries. Of course, you can turn off this feature and play one-line-at-a-time if you prefer. Note: All ranges are in concert (non-transposed) with C4 being middle C.
In addition the the divisi sections listed in the charts above (which all are comprised of unique samples), the library also includes several auxiliary divisi sections to round out a few of the patches (for example, the Alto Trombone and Flugelhorn). These sections were created using transposed versions of real recordings and do not require additional RAM to load. However, they do allow for separate humanization and stage placement in cases where you want a larger and more diverse section. 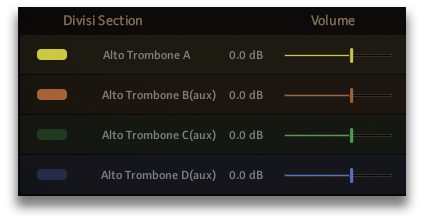 It may not be often that you need 4 divisi Alto Trombones, but if you do they are included. About 160GB with loss-less compressed audio files (approximately 260GB uncompressed). 300GB required during installation. Full Mix Only 40GB Library version also included (in the “Optional” section of the Audiobro Download Center). NOTE: Once successfully installed, please make a safe backup of the library for future reference. There is a $25 Amazon Web Server costs re-download fee if you want to re-download all of MSB’s sample data. Requires Kontakt Player 5.8 or later. Click here to download the latest free version of Kontakt Player.